Here’s my deal… I have NEVER been a runner and actually thought that I couldn’t run. I had no problem with quick sprints, like running the bases in softball, but that was the extent of it. I tried to take up running twice in the past and in about a block’s span, got so winded with a pain in my side and shins that felt like they were going to shatter, that I gave up both times. Since Christmas 2010, I have been going to the gym about two to three times a week and do about 35 minutes on the elliptical machine and then about 25 minutes on the weight machines. Heck, I even think that’s not bad! I started doing the elliptical machine 20 minutes though and worked my way up a bit. So, when Diana brought up the Chicago Marathon, I decided that I would try running again. I bought the “Couch to 5K” app (C25K) for the iPhone (90 day training to be able to run a 5K), grabbed my shoes and just dove into it. Well, my side and shins did act up a little, but the app only had me jog very short periods to begin with — but there was a voice that told me when to run or walk (NO, it wasn’t a little voice inside my head!) — AND it allowed me to play my favorite music during, to keep me going. 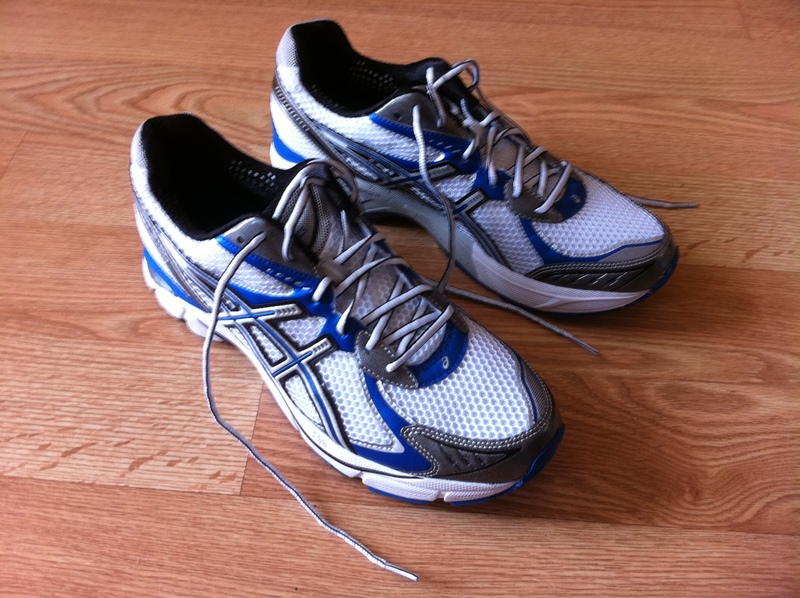 After that, I kept on truckin’ and even bought my first pair of running shoes from The Naperville Running Company. Compared to my Cross Trainers from Kohl’s, these “Asics” made my feet feel like they were newborn babies, cradled in a blankie! On top of that, I’ve been talking to people like Kevin, Jason, Alexandra, Allyson, Jenny, Danielle and others about my new challenge. I began getting tips from them as well as support because a couple of them were starting out just like me. Comrades in arms! In talking with them, it kept me going and made me want to do this for myself, but also because it was FUN to have something new in common, where we could talk about tips and healthier eating. So, that’s what Kevin and I are trying to give back through this blog — support for YOU too — because we know what it’s like to try something new that may be a real challenge. So, on 4/17/11, I entered Week 5 of the C25K app’s training. When I saw the readout of what I had to do that day (three 5-minute jogs with two 3-minute walks between), I thought that would be the end of me. Y’know what? It wasn’t so bad! It wasn’t exactly easy for me, but it wasn’t any worse than the previous runs — because I increased a little at a time without even realizing it. I have to say that the next jog is two 8-minute runs with only one 5-minute brisk walk, and I’m just a little worried about it. But y’know what? I’m thinking that with the support of all of you, I will be able to do that and more. And so can you. So, join us in our quest for better fitness. You don’t have to walk, you don’t have to run… we just want to improve our team’s health a little. Whether you like to bike, need to get more steps in on your FitBit or just want to eat healthier — this is the place that you will be able to find someone or something that can get you over the bumps and to where you would like to go. Thanks for sharing your story and WOW this blog is great.